Is servitization right for your manufacturing company? Home / Articles / 2019 / Is servitization right for your manufacturing company? Here's what you need to know when you're considering moving to a services-oriented business model. The manufacturing industry is changing before our very eyes. Many companies that once sold products are now also becoming service providers. 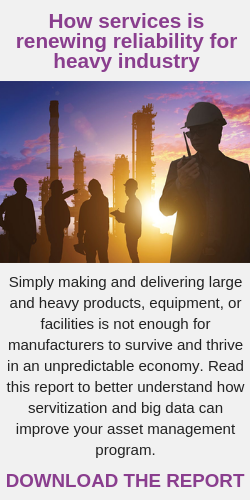 Services such as monitoring, maintenance, and training are offering new revenue streams for traditionally product-focused companies and helping their customers achieve better plant maintenance and reliability without increasing headcount. But is servitization right for your company? Here are three perspectives to help you decide. Servitization is a way for a manufacturer to add capabilities to enhance its overall offering beyond the product itself. One famous example is Apple, which did this several years ago when it had gained the majority of market share with the iPod and introduced iTunes to increase loyalty, differentiate itself in a quickly evolving marketplace, and generate more revenue. You may question whether the service model will ever be a fit for your business, but companies are now reaping the benefits of servitization across many different subsegments. For Poland-based furniture manufacturer Nowy Styl Group, servitization has been crucial to growth. In 2007, the company declared, “(F)or us, chairs are not enough,” and started a transformation from pure manufacturer to office interior consulting company. Another example is a company that manufactures cleaning products and started to offer delivery and service dosing systems. The company understood that choosing the right cleaning products was only part of its customers’ main objective: keeping their premises hygienic. Applying the products in the most effective way, choosing the right accessories, and establishing the right routines—all of these, too, were crucial to keeping premises clean. For end users in industry—users often struggling to meet today’s production and maintenance demands and sometimes with limited appetite for the risk involved in investing in emerging trends—this shift in purchasing models is significant. Questions about the ultimate ROI of a performance-based contract and the disruption to traditional workflows and responsibilities that a contract model could possibly create loom large in many managers’ minds. But confronted with the manufacturing industry’s urgent realities, including leaner-than-ever staffs and the knowledge gaps created as rising numbers of longtime plant-floor employees retire, more manufacturers are starting to explore how performance contracts could help them meet their needs. The challenge with training an on-site technician is that the knowledge may decay or the technician may leave for another role before the skill is needed, Rio notes. As a result, users look to the supplier for support, and services have become an inseparable component of the product.